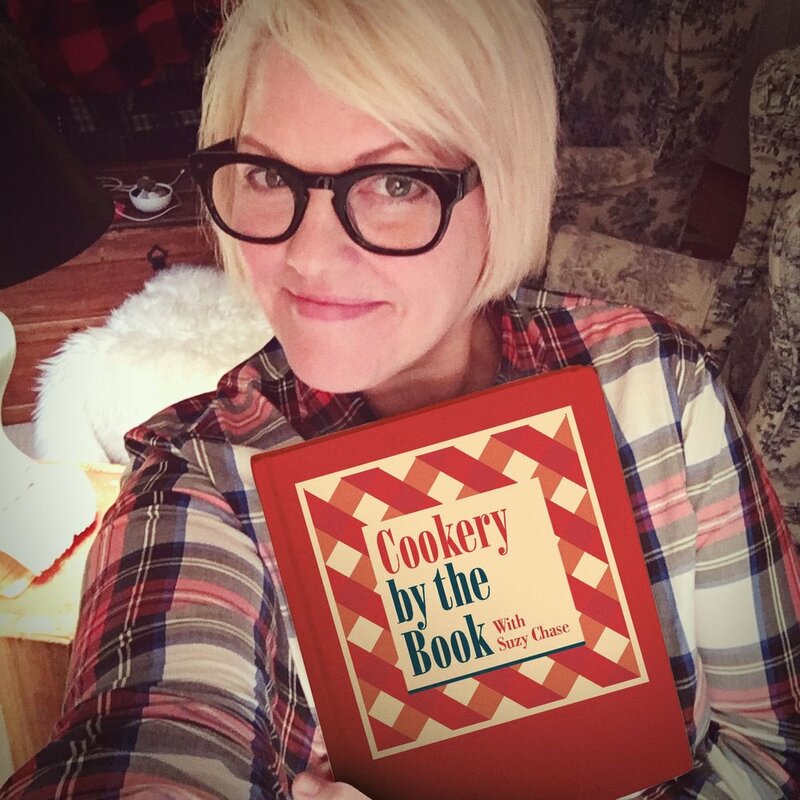 Suzy Chase: Welcome to Cookery by the Book podcast, with me, Suzy Chase. Aileen: Hi. This is Aileen Bordman, and I'm the author of the new book Everyday Monet. Suzy Chase: Describe the beginning of your journey at 23 when your mother sent you an envelope. Aileen: Ah. Well, you know, I had entered graduate school, and I was sitting in my apartment and received this envelope, which is your typical kind of envelope that comes, at the time, that was sent for email, not email, but for airmail from England and France and the like. I opened it up just as if it was any other correspondence of the time. I actually had been dating a man from England and was receiving many of the same similar configuration, and then realized this one was from my mother. Aileen: I opened up this envelope quickly, and then quickly stopped opening it quickly because I realized that she had placed a beautiful sprig of, at the time of course, fresh lavender in the envelope. I immediately could smell the gorgeous scent, and thought, "Oh, this is just so lovely." Aileen: It took me a few moments to realize, or to take it in, that this wasn't just any sprig of lavender. That this was a sprig of lavender that came from Monet's garden at Giverny, a place where my mother was now residing. A place where she and a number of other Americans were busy trying to restore what had fallen into ruin for many, many, many, many decades. Aileen: I was so overwhelmed by the significance of it at the moment. I'm not the most sentimental person in the world, and I am proud of myself, because I maintained this envelope and this sprig of lavender to this day, and happily I got to take a little photograph of it and place it into Everyday Monet as a sort of representation of history, and a spanning of the decades, and the beauty of Giverny and also stewardship of preserving. That's really what I'm trying to do is help ... I'm one of the people. I'm just one of the people who's out there trying to preserve the legacy and the beauty that Monet created for all of us. Suzy Chase: And your mother is one of the Americans responsible for the renaissance of Monet's home and garden, too. Aileen: Well, she is the most significant in the duo, that's for sure. My mother has been the American representative at Monet's garden at Giverny since 1980. She has resided there every spring since then. She's at Giverny right now, in her 38th year. The garden will celebrate its 40th year obviously in two years, but this is the 30th year that Giverny has been opened to the public since it was restored. Aileen: In the early days, she actually slept in Monet's home before she had her own accommodations. I'm happy and very proud to say, and this is the first time I've said it in an interview, that we received very special news. Meryl Streep had nominated my mother to receive the highest cultural award from the French government. It's the Chevalier des Arts et Lettres. It's the subset of the French Legion of Honor in terms of cultural aspects, and we just got notification that my mother has been awarded this tremendous honor, that's special. Aileen: It's just, she's been very quiet about what she's done all these years. I'm the one who's out there now singing her praises. She's done this under the radar, and done it simply as a journey of love and devotion also to the beauty that Monet created at his home and gardens in Giverny. I'm happy to see that she's getting some of the recognition I think she didn't want, but she so deserves. Suzy Chase: So, Claude Monet, a founding father of the French Impressionist movement, but a little known fact is that his family wanted him to be a greengrocer in the family business. Isn't that interesting? Aileen: It's very interesting. And it says a lot about one always following one's own heart and one's own inclinations. Another little known fact is that Monet started out as a caricature artist. He did caricatures of, whether it was people on the street, or the local baker, or the president, prime minister of France Clemenceau, he would do these little caricatures. That started the process of art for Claude Monet. Aileen: His family obviously over the years became more supportive of his endeavor, because after all there are very few artists that in their own lifetime have success. The word "starving artist" is the norm. Unlike many of his cohort, Monet was successful. I'm sure, of course, this led to a lot of pride with respect to his family, and I'm sure they forgot quickly that they wanted him to be in the grocery business. Suzy Chase: He had a lifelong obsession with color. Talk a little bit about Monet's palette. Aileen: I will, and again, wow, what a great question, because Monet's palette was a departure from the other palettes, P-A-L-E-T-T-E, in the world. One of the things that happened at the time of Monet was a development in the field of artwork, and that was that they, you used to always have to mix your pigments and create your paints, and all the sudden there were tubes of paints. All of the colors were now being sold whereby you could purchase them, and Monet did also purchase these in tubes. Aileen: It allowed for two things. One, it allowed for the real burgeoning of the Impressionist movement. Being able to get out en plein air, which means in the outside air, under the sun, in the sunlight, with your palette and your paintbrush and your canvas, and get out there and do a landscape. Paint a water lily. All of the wonderful things that Monet did. But it also allowed for the mixing of colors to be much more accessible and easily done in the moment. Aileen: Monet took considerable advantage of this. One thing in particular about Monet's palette, painter's palette, is that he never, ever used black. He always created the feeling and the shadows, because of course Impressionist painting is all about the light and the beauty of the light, and how color resonates based on how the light is hitting it. So, Monet never had black on his palette. I don't think a lot of people know that. And that he created the sense of the shadow, the sense of lack of color, lack of color of the palette, with the use of the shadows and the light on the canvas. Suzy Chase: And then it's been said that late in life he had cataracts, and he painted colors by memory. Is that correct? Aileen: He had horrible cataracts. Obviously he was spending a lot of time outdoors and there weren't sunglasses at that time. He had two significant surgeries to help restore his light, his eyesight. In fact, a lot of his later paintings that may look a little bit more Impressionistic may not be due so much to Impressionism, but Monet's eyesight deteriorating as much as it did. Aileen: At the end of the day he was able to find, friends brought him eyeglasses that actually contained these lenses by the very prestigious and amazing lens maker Zeiss, Z-E-I-S-S, out of Germany, and that in his later years helped restore Monet's ability, at least for the last two years of his life, to see. Aileen: What you mentioned about memory is not something that I'm particularly familiar with. I've not ... I would not say that's correct, but I have heard it, and there are many urban legends about Monet. Aileen: There's a wonderful urban legend about him winning the lottery. That he won the lottery and that this afforded him the ability to purchase the property at Giverny, but just like his cataracts, another urban legend. Suzy Chase: One of my favorite Monet's is his first wife Camille in a traditional Japanese kimono. It demonstrates his passion for Japanese style. The Water Lilies series is the most iconic series of works, which he cultivated and was very influenced by Japanese art. Did he also have a passion for Japanese cuisine? Aileen: It's interesting. Cuisine in particular I would say he wasn't familiar with. He never did get to visit Japan, although there were many Japanese visitors that came to Giverny and still do because of Monet's passion for Japaneseism, which was not unique only to Monet. There were many of the Impressionist artists, and at the time they were collecting the wonderful Japanese woodcut prints, but in particular he didn't get to enjoy Japanese cuisine. Aileen: Having said that, and knowing a little bit about Monet's palate, the P-A-L-A-T-E part of palate, he would have loved Japanese cuisine, the freshness and the preparation, and of course how it is displayed on, plated, for lack of the better word of saying it. How they artistically plate their dishes. It would have been something that would have appealed to his sensibilities very much. And of course he loved fresh fish, without question, and was interested in spicy foods. Aileen: I have no doubt, in fact, I include in my book Everyday Monet, a little take on a steak sandwich, and I created a dressing, and I used wasabi in the dressing, because Monet loved spicy foods, and this is my way of introducing, or bridging, his love of Japanese culture and art and integrating it with his own tastes and sensibilities with food. Suzy Chase: All throughout the book you have neat little Everyday Monet ideas, like line your kitchen walls with copper pots, bowls and pans. Monet had quite an affinity for copper. Talk a little bit about that. Aileen: They're not just utilitarian, they're gorgeous. They're stunning. And the way he had them displayed in the kitchen, and the way ... even if you cannot afford a full range of 20 copper pans, perhaps, as Monet had in his home, even a very small little copper dish or a small little copper pan in your kitchen or anywhere in your home can connect you to Monet's love of copper. Aileen: Also copper, getting back to Monet's art and his love of and appreciation of how light plays off of different items and plays off of landscape, copper has such a beautiful way of reflecting light. In Monet's kitchen, in the early morning, the way the light dances off of the copper pans that are hanging across from the windows, Suzy, it's beautiful. What can I say? Suzy Chase: Didn't he acquire Giverny because of the light? Aileen: It is said, and it's true, that Monet and the other Impressionists first saw the light going to Normandy, taking the train from Paris. Clearly, at the time, Monet was successful and could have lived in Paris, could have lived anywhere. But there was something about Normandy, the mists, and the light that was so attractive to him. It wasn't just that it was where he was born, it was something that was really, really special to Monet. Aileen: He found the property, and it was an old cider press that he, over time, developed and renovated and put additions on, and created the water garden, and really created this magnificent oasis that we get 8,000 people a day now during the months that the garden is open visiting, because it's a place of wonder. It's a place of magic, and it's really a place to make a pilgrimage. It's not just any other place in the world. Suzy Chase: Monet was very interested in the layout, equipment and design of his kitchen, which happens to be your favorite place in the home. Suzy Chase: Please describe the kitchen. Aileen: The kitchen is not very large. It's a country farm layout. There are two very, very large windows which allow significant light to come in. There's a large iron stove. There's a lovely kitchen table. There are orchids in the kitchen, which Monet would always have and we, to this day, make sure that there are orchids. There are the copper pans, and there are tiles that lined the walls and often visitors mistake these tiles as being from Holland, and they're not. Aileen: They're actually from Rouen. They're French tiles, blue and white tiles. They're so beautiful. Rouen is about 40 minutes north of Giverny, and it's where Monet did the wonderful series of the cathedral at different times of day and in different light. So, these beautiful tiles line the walls, and it's just, it's welcoming, it's beautiful. Aileen: It's got just ... the color. There's a blue in areas where there's paint required. There's a blue that I have actually identified in the book if somebody wants to paint their kitchen blue, all they need to do is drop the color swatch, or bring the book to their local paint shop and they can match it up and have that same sort of dreamy, eggshell blue that Monet had in his kitchen. Suzy Chase: Now in this gorgeous kitchen, Monet did not like to cook. Talk a little bit about Marguerite, his chef. Aileen: Yes. Well, Marguerite was with Monet almost from the get-go, when he moved with the family to Giverny, and she was a dedicated ... she became part of the family. She was a dedicated chef for Monet, and the family, and helped with all of the entertaining. He had many quirks in terms of his eating habits which I discuss in Everyday Monet. Aileen: Every day she would go to, because in Monet's time, as we're trying to do today, they wanted to eat what was fresh and what was seasonal. We're all trying to do that more and more, and thankfully that's the case, to eat locally and eat fresh. They would both, together, Monet and Marguerite, just go up the road to where Monet had planted a kitchen garden, a potager. This is where he had all of his vegetables and herbs. Aileen: Some of them were seeds that Monet brought to Giverny, and had never been planted before in Normandy. I'll give you an example. Zucchini, which he had enjoyed in Provence while he was painting there, didn't exist in Normandy. Monet had never had them before, and he collected the seeds and he brought them back to Normandy. Aileen: Giverny is Zone 8 for those that are interested in zones, when planting flowers and the like, and Zone 8 was conducive to having the zucchini grow as well. So Monet, besides being the father of Impressionism, can be credited for bringing many flowers and vegetables to Giverny, to Normandy, that had never grown there before. Aileen: Getting back to Monet and Marguerite, every day that Monet was at Giverny, because of course he traveled a lot to paint, when he was at home, he would visit the kitchen garden with Marguerite, and they would plan the menu with her suggestions and with his suggestions based on what was fresh that day in the kitchen garden. Marguerite remained at the house after Monet passed, but she couldn't live there for much longer, she was just so sad. Eventually she left. But it was a wonderful relationship, friendship, and she really, really became part of the family. Suzy Chase: What were a few of his food quirks? Aileen: Monet's food quirks were many. And that's okay. Look, you know, he wanted what he wanted in terms of many things in life. Suzy Chase: He was an artist. Aileen: He's a good artist, yes. And you know, he was a Renaissance Man. His quirks were he had to have ... Something so silly, like how well his asparagus were cooked. They used to have to watch over the pot to make sure that they didn't go limp. He would send them back from the table if the asparagus weren't properly cooked. Of course, he loved pepper, and he actually had his own little dish of pepper. Instead of the pepper mill or the pepper and salt at the table, there would be that for everybody he was entertaining. But then, in addition to that, Monet would have to have his own little dish of pepper. Aileen: It was not unusual, Suzy, for Monet to all the sudden be entertaining people at lunch, at a beautiful lunch with many courses, and the wine was flowing, and champagne, and there were going to be desserts, for him to all the sudden stand up and literally run out of the dining room. He did so because all the sudden he saw the light change upon the table, and he knew that the light had changed in the garden, and there was something he wanted to capture on a canvas that he had left. So, he would literally leave. Suzy Chase: Oh, my goodness. Suzy Chase: You can do it. Aileen: ... you're the father of Impressionism, people got it. They understood. Suzy Chase: It's funny that you brought up the pepper, because a cookbook author friend of mine, Judith Fertig, who knew I was going to talk to you said, "You have to ask about the ground pepper he put on his salad." Suzy Chase: I was like, "Judith, what are you talking about?" Suzy Chase: She said, "Just ask." Suzy Chase: So, that's so interesting that you bring up the pepper. Aileen: Absolutely. I mean, it was like coated with the black pepper. And he grew, in his kitchen garden peppers, many of the spicy, hot peppers, chili peppers that we are aware of. Again, that's not necessarily French Norman cooking. Suzy Chase: No. I made your recipe for green garden potato salad on page 87. Suzy Chase: Talk about Monet's love for hearty meals that included potatoes. Aileen: Hearty meals were not unusual at Monet's time. That was really sort of how people ate. He loved the root vegetables, all kinds of potatoes were grown, and of course his love of the root vegetables and his love of potatoes inspired my wanting to do the potato salad. Aileen: I wanted to do something that if you took it to a picnic, you wouldn't have to worry if it was laden with mayonnaise. On top of that, I utilized many of the fresh herbs that Monet grew in his kitchen garden. So, I think coupling these fresh herbs with these beautiful, hearty potatoes that Monet would have loved in a dish that's as friendly on your dining room table as it would be on your picnic blanket was very, very much the way to be everyday Monet. Suzy Chase: Definitely. It was so fresh. Aileen: Ah, yeah. That's the premise, and that's what I was going for, and I'm so glad that you enjoyed it. Aileen: I would love for people to learn more about Everyday Monet, his lifestyle, and I always post additional pictures to what we're talking about on any given day at monetspalate.com, W-W-W-dot-M-O-N-E-T-S-P-A-L-A-T-E-dot com. I also have a very wonderful, engaging Facebook page that I think your listeners would love to visit. Every day we bring something new to the table, to the palate, to the canvas. As we say in Everyday Monet, we try to bring the aesthetic of Monet's beauty and the world at Giverny into your home. Suzy Chase: Even if you can't live with a Monet painting in your home or travel to France, you can experience it through the pages in this beautiful, beautiful book. Thanks, Aileen, for coming on Cookery by the Book podcast. Aileen: Suzy, thank you so much, and as we say in the world of Everyday Monet, a toast to Giverny and a toast to Claude Monet. Suzy Chase: Subscribe in Apple Podcasts, and while you're there, please take a moment to rate and review Cookery by the Book. You can also follow me on Instagram at CookerybytheBook. Twitter is IamSuzyChase, and download your Kitchen Mix Tapes, music to cook by, on Spotify at CookerybytheBook. Thanks for listening.